I've been welcoming in the year of the Snake and I wanted to share some of the things that I'm finding helpful, inspiring, and intriguing while staring off this new year. I decided to go 1 week without added sugar and without any alcohol. I really enjoy a nice glass of wine and I love sweet creamy coffee in the morning, but i was feeling a little sluggish and I wanted to give myself a little healthy kickstart for a week. It was my intention to only do this for 1 week, but after a week of drinking my coffee black, I realized that I was liking it so I've continued. I find it very interesting that by making 1 small adjustment to my lifestyle for a short period of time it's turned into a more permanent change. We get so used to the way we do things, but sometimes we just have to try to do what we do in a different way and then change happens. I'm a bit of a sucker for all of the life coach advice that is plentiful on the web. However, I get really tired of thinking that I don't have the tools to do what I need to do, that I have to take another course, or read another book, or buy buy buy something else. Dean's podcast is about making small shifts in your life in order to be happier. He comes from the perspective that you already know what you need to know, but by listening to his story and the stories he shares you may see a new way of doing things in your life. Golden. I'm building a new website. I'm using a platform called Squarespace and so far it's been really painless and simple. I'm surprisingly proud of how technical I am becoming. There is something really empowering about learning something new and taking control of something that you didn't think you could. My new website will be launched soon! Stay tuned! This is what is on my bench right now. 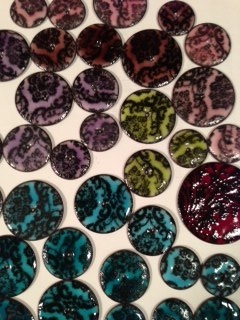 A sea of enameled copper pieces in bright spring colours.